Bradwolff Projects is showcasing a dance film by Harm Weistra: Damaged Goods, with dancers Armando Roberto Disanto and Fernando Dominguez. Written comments - posted on the internet and articulate by two voice actors - are the starting point of the video Damaged Goods. These comments seem to guide the movements of two male dancers, seemingly influencing to what extent they dare to live their lies. The contrast between these comments and the intimacy of the dancers invite the viewer to reflect and to take a stand. Although the video seems to focus on the gay community, it has a broader relevance, in the sense that it questions the impact of the internet and social media on the lives of individuals and groups. 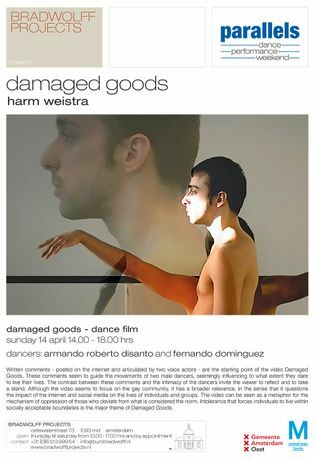 The video can be seen as a metaphor for the mechanism of opression of those who deviate from what is considered the norm, Intolerance that forces individuals to live within socially acceptable boundaries is the major theme of Damaged Goods.